May: Earlier in the week Ben asked me if I would go on a date with him. We had just gotten in a huge fight over the weekend and he said it would be nice to spend some time together just the two of us. We had been going out a lot between all the weddings we attend and friends coming to visit – which we love – but just had not been spending much quality time as a couple. Between our schedules we decided Thursday (April 15 – Tax Day) would work best. Ben: I chose Tax Day as the best way to keep her from noticing the true nature of the date night. I knew I could offset her by saying we could spend some of my tax return by having a nice evening together. May: Thursday morning on my way to class I remembered that I still had not talked to my dad in Boston about my upcoming graduation so I gave him a call. Little did I know that Ben had just called him the previous day. So when my dad answered in a very excited voice, I was a little surprised. He asked if I had anything to tell him – to which I responded, “Well, yeah. I’m graduating.” Then his voice dropped a little and he asked if there was anything special going on with Ben and I – to which I responded, “No. Ben’s fine, I’m fine, we’re fine.” Then my dad says, “Oh, didn’t Ben tell you he called me yesterday?” To which I exclaimed “NO!” and he responds with a quick “Oh! I should stop talking now.” Then of course he not so subtly proceeds to gush about what a wonderful guy Ben is and how happy he is that I am with him. Ben: All my careful planning and it could have been thrown away in a few seconds. May: This is about the time that I start to freak out! I knew the only reason Ben would call my dad is to ask permission to marry me. I was so excited but I didn’t know when it would happen and I knew I could never let Ben know that I had found out. I always seem to find out about surprises too early. I also didn’t know how long I could keep my composure and was worried that I would just burst if he waited another couple months and I had to pretend to be none the wiser. I called my cousin Janet who sounded so unenthusiastic and unconvinced about the whole ordeal that I was crushed. Ben: Janet was unenthusiastic because she was one of my many spies and aides. She called me immediately worried that everything was falling apart. I didn’t worry. I could easily explain away my call to her dad if needed. I informed Janet I would just say that I was attempting to see if he could fly out for graduation. May: I chatted with my close friend Erin online about the spoiler and she managed to turn it into a whole ordeal about how mad she was that she was not included in the planning of it all. This made me feel even worse! Why were all the people around me being so mean? Ben: Again, spies and aides. May: Why couldn’t they just be happy for me??? Ben: Because I called them to assess any further damage control on the secret of the evening being spilled. May: And why wouldn’t any of my other friends answer their phones???? Although it did cross my mind (which I mentioned to Erin) that maybe, just maybe, EVERYONE was in on it and they all knew!!! May: I would pride myself on my cleverness but in truth, every single possible scenario of what could be happening and what might happen buzzed through my head all day long. I got to school and I confided in a friend who managed to get my excitement up again without getting too excited – though that was hard to keep control of. I went to work but I couldn’t concentrate on anything all day! Despite the spoiler, I was pretty convinced it was not happening that evening. There was a small glimmer of hope but I honestly didn’t think it was going to happen. Ben: I made sure to head home early to get ready and to calm myself down for any nervousness that would begin to hit me as we moved closer to time. When May continued to ask where we were going, I continued to answer Carl’s Jr (Hardees to those east coasters). She sounded still thrilled to go and they do make a tasty burger. May: I rushed to get ready after arriving home from work late. I became increasingly frustrated when my roommate, Lindsay, refused to come downstairs so that I could ask to borrow her dress. Ben: Lindsay has a terrible poker face and attempted to stay on the phone and away from May in order to give away nothing. It’s a shocker she made it that long. May: Ben took me out to our favorite restaurant in San Francisco, Cappanina. It is one of the first SF restaurant dates we ever had, via a recommendation from our friend Jim, during my first year of law school. We had an amazing meal – the works! Ben: Part of dinner was a gift from me and flowers waiting for us at the table. Bless you opentable for making my life easy. The gift was a book that she already had. Around the time when we first started dating, we traded favorite books in hopes to “educate” the other. She finished mine, Invisible Monsters, rather quickly while I’ve put off Catch-22 until…well…now. Thanks to the power of the audiobook and my daily commute I was able to comply with a request for me that May had probably forgotten. She was thrilled to hear that I had finally read it and I was just thrilled to finally be able to discuss it since one can find a Catch-22 anywhere and everywhere. May: Yay, he read a book! Ben: I even snuck in a Foursquare checkin at the restuarant. I was so proud to see that I was now the mayor. This was truly myour night. May: After dinner, it was getting a bit late and I was tired so when Ben asked if I wanted to go out after dinner I said that I’d really be happy just going home and watching a movie. So we headed out. Ben: I made sure to play dumb on the best way to go home as my next planned stop was….well…planned. May: The route home takes us towards the Golden Gate Bridge. The exit to our house is immediately before you cross the toll to actually get on the bridge. I kept telling Ben to get over or he would miss the exit and when he finally tried to get over we nearly got side swiped by another vehicle – thank goodness we didn’t – and missed the exit. Little did I know this was all a part of the master plan (minus the nearly dying part)! Ben: For the record I paid that car to do it. It was the best way to throw May off and we practiced the almost crash for weeks. Ok, I was just an idiot and I was nervous. We are all ok now. May: We are crossing the bridge and I suggest that since it was a clear night we should drive up to the overlook point on Hawk Hill (Marin Headlands). This was apparently Ben’s plan all along! Ben: She makes my life so easy. May: We get out and are enjoying the beautiful view. It is a clear night and the city and the Golden Gate Bridge are just lit up and glittering (best view I could find from Google, follow the road off the bridge). I get a little cold and suggest that we get back in the car, but Ben insists we stay out and he wraps his jacket around me. 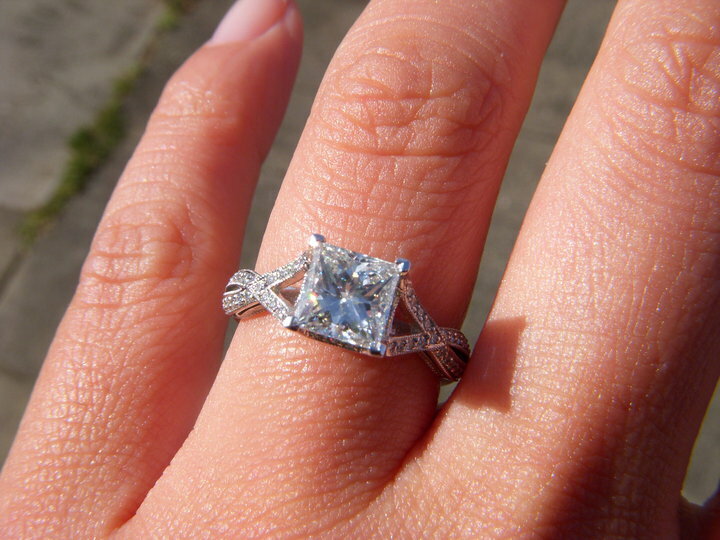 We stay out there a little longer and as I start to head back towards the car he drops down on one knee. I look down at him stunned. Ben: Here’s the actual conversation at this point. Please keep in mind that the ring I am holding is a little toy ring. May: Shut up! Get up! That’s not funny! Shut up! Are you serious??? That’s not funny! Ben: I am serious! Will you marry me? May: YES! YES! YES! YES! Ben: I was nervous enough to put the toy ring on the wrong finger. No one is perfect. May: I had always told him that I would be perfectly happy if he proposed with a toy ring and let me go pick out a real one – I can be a bit picky! Then of course came the crying and happy kisses. We sat out on the lookout point a while longer while he explained to me how he had been planning this for quite a long time and how pretty much everyone was in on it!… all the people who had been so mean earlier in the day were just trying frantically to do some damage control while alerting Ben to the possible spoiler! Ben: I really enjoyed the part where she was perfectly content with the toy ring for about 20 minutes and not knowing that anything else even existed. May: We got back in the car and Ben looked at me and asked if I would like an upgrade to my ring. He pulled out a small box and I got really excited. I told him to ask me again. As he opened the box, he asked will you marry me and I exclaimed YES the second I saw the beautiful glittering rings inside. Ben: I quickly reminded her that she had to actually look at me when she provided the answer and not the ring. May: I looked at him and said ‘yes’ and started crying all over again. I was so excited and everything was just so perfect. I just don’t know how everyone who knew managed to keep it a secret for so long! Thank you to everyone for making it such a wonderful night for us! It was perfect! End scene. Man, I’m glad that’s over. I’m emotionally spent now. A-MAZING. Way to go, Ben! Well, done! I love that you all it a “spoier”. And May, you have smart friends. CONGRATS! That is amazing! I’m so happy for you guys! And Ben good job, I know how hard it is to surprise us girls. What a great story! Glad you still remember how to write those scenes for video productions in gifted class. You did such a good job planning every detail. Ok-i cried! You two are the best! I am so happy for you. Congratulations. I think my colleagues now think I am crazy crying to something on facebook! Congratulations to both of you. Could not be more excited!!! Im excited for the both of you and Ben you did a great job but man I’ve got to ask, with all that planning and getting everyone to help you out with keeping it a secret, why didn’t you just tell her dad not to say anything to her about it? Ben, congrats man….from one that has come close to watching his carefully planned devious engagement plan almost get messed up I know what you went through. At least now it gives you 1 heck of a story to tell forever!